Our first Happy Fall Ya’ll Giveaway!! Who doesn’t like a fun giveaway? We wanted to welcome fall with some fun and of course I just had to team up with my friend Anita of South Hill Designs- by Anita for a unique way to celebrate the season! Who’s ready for our first Happy Fall Ya’ll giveaway? Grab your pumpkin spice latte and make sure to enter to win below! And don’t forget – the more entries you complete the more chances you have to win- just use the easy widget below and enter away. Make sure you share with all of your friends and family too! This giveaway is just oh-so-fab with an amazing prize. Yep, one lucky winner will win this beautiful locket. South Hill Designs lets you create and customize jewellery that tells your story. These beautiful lockets allow you to display the things in your life that you treasure! This fall inspired silver locket with crystals, a silver flower screen and gold pumpkin with three crystals representing the colours of this beautiful season. my orange cardigan perfect for the fall time…. My favorite fall accessory for fall is boots.I wear sandals and flip flops all summer and love changing into boots in the fall. I love boot for the fall! I have an orange vest that I love to wear in the fall! I love the colour orange (it’s my daughters favourite colour too)! My favorite fall accessory is scarfs. Hmmmm….my favorite fall accessory – that’s kind of hard because I don’t really have one…I don’t think. I do change my accessories to browns and gold…I’ll wear gold necklaces and bracelets more often. My favorite fall accessory would have to be boots. I love these necklaces! What a fabulous giveaway! My favorite Fall Accessory is my sweaters and jeans. I love cardigans, boots, skinny jeans, and leg warmers! Thanks for hosting such a great giveaway! Such a pretty necklace! This locket is so pretty!! This necklace is so elegant! I’d love it for fall! This is adorable! 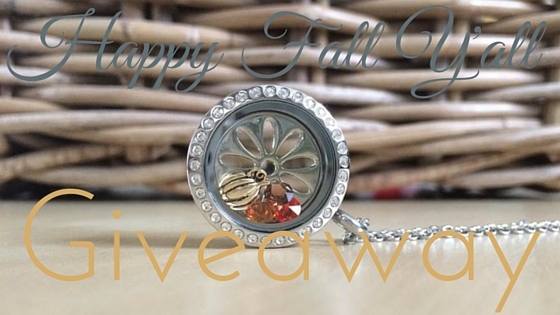 Thanks for hosting this giveaway, fall is one of my favorite things! What a pretty necklace. This would make a great hostess gift for Thanksgiving this year. Perfect Fall giveaway. I love that locket. I like this locket! It is so pretty! I am entering the contest now! What a lovely locket. A great gift idea for a friend or yourself. Who doesn’t love a fall giveaway! And someone will be a happy, lucky winner! Fall is my favorite time of year! I love these lockets. Love that you can tell a mini story with them. I am still loving this necklace. It would look nice with my fall t shirts. My favorite accessory for the fall are scarves! That’s pretty! My six-year-old has this new obsession with lockets, and I remember having the same one start around her age. It’s very special. So Pretty! Just in time for Fall. That necklace is so pretty. Wish I wore more of them! This is really lovely, great giveaway! What a beautiful locket, and charms! Are they interchangeable? That could be fun to change with the seasons. Great giveaway! Beautiful locket! I would love to win it! What an adorable and unique necklace — and perfect for fall! This necklace is very pretty! Good luck to all who enter the giveaway! My favorite Fall accessory would have to be boots! I love that I can start to wear boots in the Fall! What a beautiful necklace! I’m so glad it’s starting to feel like fall here! I love wearing comfy scarves for my fave fall accessory. What a cute locket! Beautiful pendant, thank you for the giveaway. BTW- the last entry for twitter does not work and says the page does not exist. Thanks for the heads up…it’s fixed now! Fall is my favorite time of year! From the cooler weather, the beautiful colors, and the clothes! I would love to have this locket… it’s gorgeous! Oh, my favorite fall accessory is a scarf! This locket is just too cute! I need a little bling to go with all my fall outfits and this would be perfect! That is truly a beautiful locket and oh so perfect for fall. Good luck to those entering. I love scarves. Nothing makes a messy bun work better than a great scarf! That necklace is pretty awesome, though. Love the locket! I got one at a blogging conference in LA! I love wearing it! It has blog inside!!!! Giveaways are fun. I like the look of this necklace, and it would go great with some turtlenecks or a t and flannel look for the Fall! What a beautiful locket. And perfect for fall. 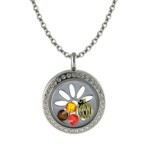 I love the look of this locket! I’d love to win it because I actually prefer necklaces and earrings for jewelry accessories! how fun is this giveaway! that necklace in your post is really pretty! I love scarves in the fall! Your twitter link isn’t working. It looks like “with” is misspelled. Is it on the rafflecopter? or on my page? what a lovely necklace. My favorite thing to wear in fall is my slipper boots. I love, love, love these sweet lockets. I have to wear mine more often and GET more charms to change up the look. What a gorgeous locket. I WANT one, so I guess I need to enter, huh? Yup!! I am thinking of purchasing one for myself. She has a lot of really great designs. You should see what she has for Halloween! That is such a pretty locket! It’s a great Fall-themed gift to get you ready for all the fun that Fall brings.